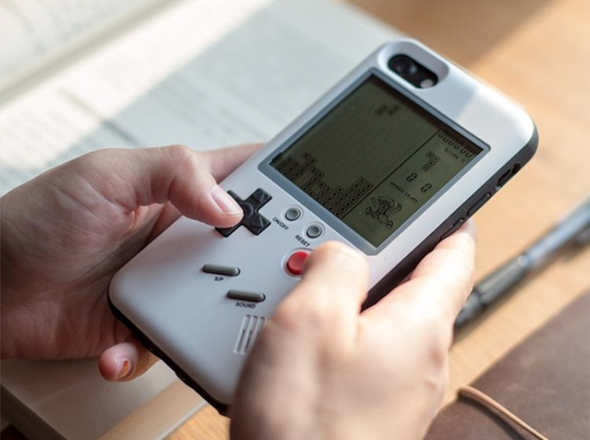 A protective iPhone case with 10 pre-installed nostalgic games that looks like a Gameboy. Yep, I’m interested. The Wanle Gamers Console Case for iPhone ($25) is retro-cool and includes Tetris, Snake & Block, Formula One Racing, and more. Available in iPhone 6, 6s, 6plus, 7, 7plus, 8, 8plus, and X.
Lightweight perfect fit – This ultra slim design, you’ll barely notice in on your iPhone. Full Port Access – All buttons, microphone, speaker, headphone jack, dock, and flash. Hard Plastic Protective Goodness – The slightly raised controls and buttons gives you the unique, authentic shape, and feel matching the original classic game. Raised Buttons – The sleekest and sexiest controller case. Helps protect against those bumps and falls. Just like the real thing – Installed with 10 classic games like Tetris, Tank, Formula One Racing, Snake & Block, and etc.